Nimble enables you to import contacts from multiple sources including CSV files, vCard, social and email accounts, and third party integrations to start organizing your database and build stronger relationships with your customers. If you haven't yet, visit the Contacts tab and click "Import Contacts". This will redirect you to Settings >> Networks & Imports where you can start setting up your account. Take a look at our "Get Started: Importing Your Contacts To Nimble" article for more details. 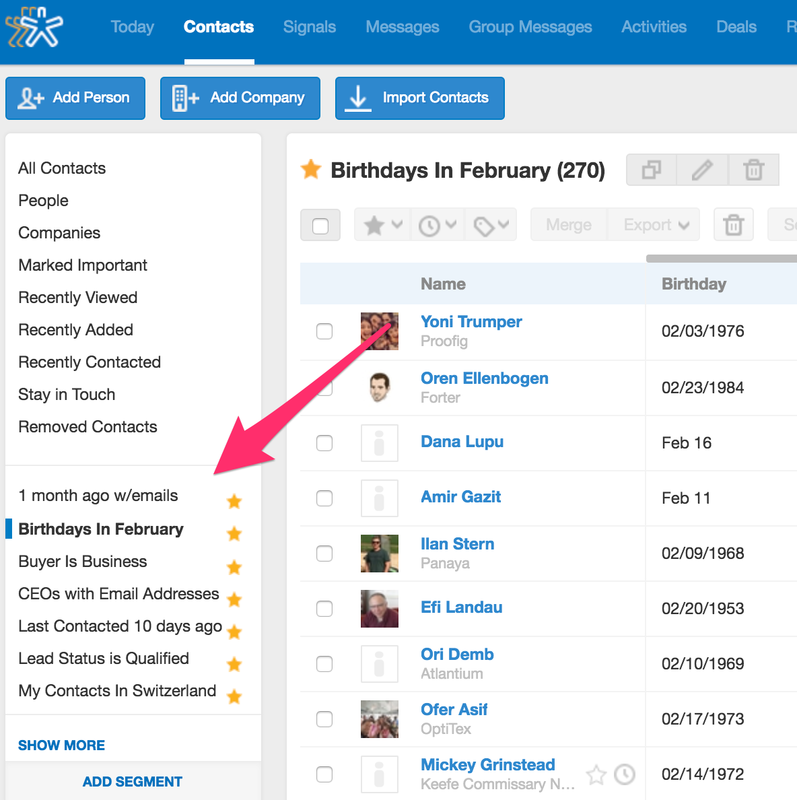 Once your contacts have been added to Nimble, they will display in the Contacts tab. In addition to adding contacts in bulk through the Networks & Imports page, contacts and companies can also be created individually using the "Add Person" and "Add Company" buttons at the top of the page. Start by clicking "Add a person". A window will pop-up with the option to add the person's "Name", "Title", "Company", "Email" and "Phone". Or click "Continue Editing" to add more information. Selecting "Add Company" will provide you with the option to enter a name and domain for the company. Or click "Continue Editing" to add more information. All Contacts - View all of you and your team’s companies and contacts. 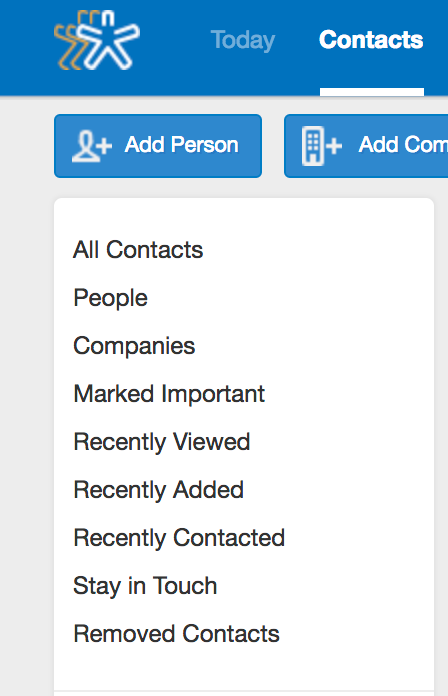 People - View all contacts you and your team have imported. Companies - View all companies you and your team have imported. Marked Important - View all contacts that you have starred to mark as important. 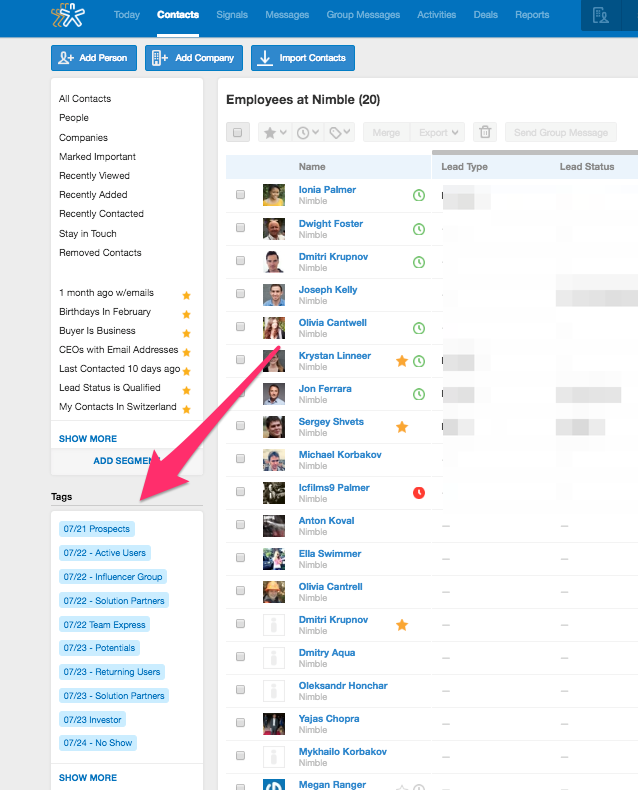 Nimble Tip: You may sort the All, Important, People, and Company lists by Last Contacted Date, Creation Date, and Name. Recently Viewed - See the last 30 contacts you have recently viewed. Recently Added - View contacts that were recently added. 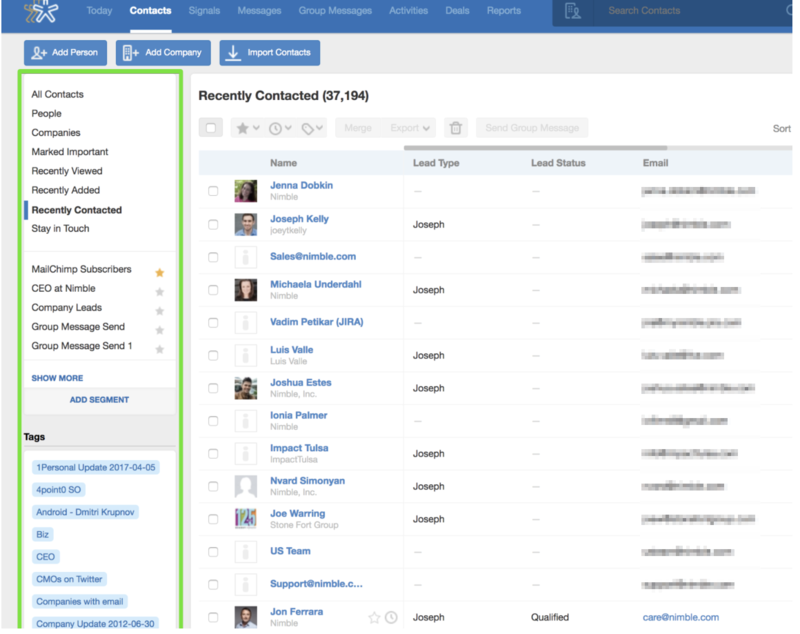 Recently Contacted - View contacts that were recently contacted by your team via email or social media. Automatically mark a group of contacts as important, set "Stay In Touch" time intervals, apply tags, merge, export and delete contact or send them a group message all in bulk. The quickest way to organize your contacts is by applying a Tag as they can be applied during import and in-app. Once tags are added to your contacts and company, it will appear in the Tag section. After a saved segment has been created, it will appear on the left side of the screen. Saved Segments that have been marked as important will appear towards the top of your list. In the Contacts tab, select one of the filters from the default lists or custom lists (as indicated above) and then choose a category to sort by. Select the up or down arrow to sort top-to-bottom or vice-versa. Create the order in which your field lists display by using "Table Settings".